University Occupational Health Services is committed to managing the full range of services needed to safely place workers, maintain the health and productivity of the workforce, and restore injured employees to health as quickly and cost effectively as possible. This is achieved by developing a personalized program that may consist of pre-placement physical exams, return-to-work exams, work-related injury treatment, drug screens, breath alcohol testing, medical surveillance, FAA pilot medical exams, and other medical services specific to industry. The medical staff, consisting of M. David Stockton, MD, MPH, Gregory Blake, MD, MPH, Jon Parham, DO, and Donald S. Keeble, MD, is committed to providing the best medical care for employees, while insuring compliance with the legal and regulatory issues involved in occupational medicine. The medical and legal needs of the three customers are recognized: the patient, the employer and the worker's compensation insurance carrier. Service effectiveness is based on timely communication with the employer and appropriate use of supporting services. Occupational medicine services are offered at the University of Tennessee Medical Center location Monday through Friday, from 8:00am to 5:00pm. Though appointments are requested for pre-placement and periodic screening, medical care is offered for client companies on a walk-in basis for injuries and accidents. Complete diagnostic screening and x-ray capabilities allow efficient delivery of services. Equipment and services available at the clinic include full provision for physical examinations, vision testing, audiometry, pulmonary function testing, x-ray, electrocardiogram, breath alcohol testing, drug screen collections and MRO services for non-DOT and DOT, and a variety of laboratory studies. FAA exams can be scheduled with ease because there are three Aviation Medical Examiners on staff. Drs. Stockton, Blake, and Keeble are FAA certified to perform Class I, II and III pilot exams. The Emergency Department at The University of Tennessee Medical Center provides after hours emergency care with drug screen collections. Tennessee Drug and Alcohol Consortium (TDAC) provides after hours drug screen collections and breath alcohol testing. These services must be arranged with them. University Occupational Health Services is not contracted with them for after-hours coverage, nor are they an extension of this program. Work-related injuries and drug screening results can be referred back to this clinic for follow-up care when the employee or employer lists one of the physicians located at this facility as his or her occupational medicine provider, or Medical Review Officer (MRO). The University Occupational Health Services now offers immunizations for travelers as recommended by The Centers for Disease Control (CDC). Pre-travel consultation and counseling including access to real-time information regarding health, social, and political situations around the world. Material providing information such as travel related illnesses e.g. malaria, diarrheal disease, etc. Please note immunizations require 4-6 weeks for full effectiveness. We recommend scheduling your office consultation at least 2 months prior to travel. Bring your prior immunization record to the visit. To make an appointment, please call 865-305-8831. Many companies require a physical examination after a conditional offer of employment has been made. Pre-placement physical examinations are determined by job requirements. Components may be included to document baseline information, to meet regulatory requirements (eg. Respirator wear and DOT), and to determine the individual's ability to safely perform the essential functions of the job. Accurate job related information including physical demands allows the physician to make knowledgeable recommendations. Other physical examinations are developed to handle post-employment and ongoing regulatory requirements. A comprehensive examination program to promote the continued good health of the work force is also an option. Other components may include lab tests as well as x-rays. Executive physicals are an excellent benefit for your key employees and a valuable investment by your company. The usual procedure involves an initial visit to collect lab specimens and complete paperwork. The second visit is scheduled one to two weeks later and includes the actual physical. Immediately after the exam, the patient meets with the physician and reviews all exam and test results in a comprehensive interview session. A single session appointment can be arranged but test results will not be available to maximize the value of the physician interview. The following is a basic suggested exam plus many additional options that could be included at varying frequencies. * The staff can arrange these tests; however billing will be done by the testing provider or facility according to its fee schedule and billing policies unless prior arrangements have been made through the facility at University Occupational Health Services. Some jobs involve potential exposure to blood borne pathogens. Other jobs may fall under State Department of Health guidelines. Vaccination or documentation of existing immunity may be required as part of your placement process. The following services are offered at the University Occupational Health Services clinic. This vaccine must be offered to all employees with potential exposure to blood or blood- borne pathogens. A series of three injections over 6 months is required. Patients are advised in writing of the vaccination schedule at the time of their first injection. This vaccination is necessary for most healthcare and child care workers. Other vaccines and/or screens are available for Hepatitis A and C, Measles, Mumps, Rubella, and Chicken Pox as well as other industrial screens such as heavy metals, etc. Based on the 1998 Final Rule of the IOSHA and OSHA Respiratory Protection Standard, a medical surveillance program is necessary for all individuals required to wear respirators including paper dust masks. This program offers two levels of service. If the only respirator protection used is a paper dust mask for nuisance dust, each affected employee must complete a six-page medical history that meets the OSHA Respiratory Protection Standard. Physicians will review the history. If no medical conditions are indicated, a physician statement approving the use of the paper-dust mask will be completed. If the medical history indicates that further medical review is needed or if a respirator other than a paper dust mask is used, the following respirator evaluation is recommended for clients. This evaluation is based on the medical evaluation program suggested within the OSHA standard on respiratory protection. Persons assigned to jobs that require the use of respiratory protection (dust mask, half or full face, SCBA) must be evaluated to determine if they are physically able to perform the work and use the equipment. All persons required to wear respirators, including dust masks, must be medically cleared prior to assignment in a job that requires respirator use, and periodically thereafter. Occupational Health Services provides work-related injury treatment on a timely basis. Treatment is given for musculoskeletal injuries (sprains, strains, and simple fractures), lacerations, foreign bodies in the eye, and similar cases where the skills of other specialists are not required. Injuries that are more complex are assessed, stabilized and referred as appropriate. Emergency Departments provide care for traumatic injuries. The general policy on all injuries is to report restrictions to the employee's management so they can determine the appropriate accommodations. Standard forms include an authorization form and a treatment information form, which is given to the employee at time of service and mailed to the company contact within 48 hours. This team supports aggressive management of injuries while keeping quality care as the primary concern. Timely services and communication reduce loss time. With the employee's (or employer's) approval, referrals to other specialists or appropriate rehabilitation programs are made when indicated. Charges for treatment are determined by the nature of the injury and are competitive with area providers. Company preferences on specialists will be honored. If there are no preferred specialists listed on the client summary profile, the physicians will utilize the specialists they are most familiar with, making sure that these specialists not only support releasing patients for restricted work duty, but that these specialists promise timely communication so that appropriate coordination of services may be achieved. To be the provider of choice by managing the full range of services needed to safely place workers, maintain the health and productivity of the workforce, and restore injured employees to health as quickly and cost effectively as possible recognizing the medical and legal needs of all three of our customers: the employer, the patient and the worker's compensation insurance carrier. 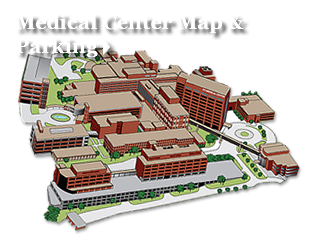 Download a the map of the University of Tennessee Medical Center or get driving directions to our campus.